Since late October, more than 9,000 sealed indictments have been filed in districts across the United States. Sealed indictments are typically used in prosecuting individuals or criminal networks in cases where revealing names could lead individuals to flee or destroy evidence. The number of indictments filed in less than three months is in stark contrast to previous years. According to a 2009 report from the Federal Judicial Center, in all of 2006, there were only 1,077 sealed indictments, and these were about 0.96 percent of all criminal cases that year. According to Marc Ruskin, a former FBI undercover agent and author of “The Pretender: My Life Undercover for the FBI,” it’s unclear whether the current sealed indictments are connected, but the high number is something he never saw in his 27 years as an agent. 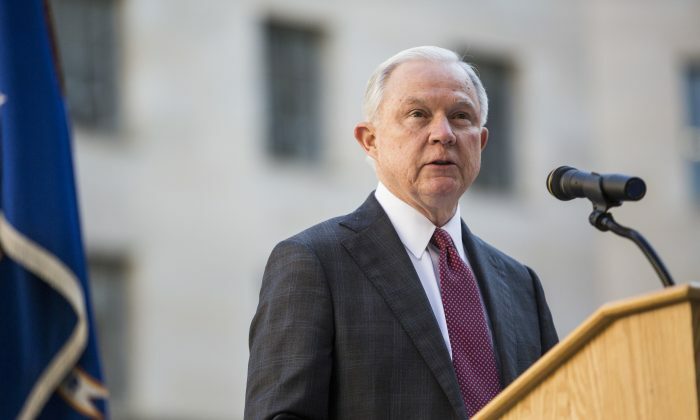 Ruskin said the large number of sealed indictments may explain the relatively low profile maintained by Attorney General Jeff Sessions. “If he’s been occupied with an initiative that is sort of under wraps and being conducted covertly, it would explain why he hasn’t had a prominent position in the media as of late—because these are things he can’t talk about,” Ruskin said. It’s uncertain what the sealed indictments are related to, but there is speculation. Some say the sealed indictments may be related to special counsel Robert Mueller’s investigation into Russian meddling in the 2016 election. Others speculate that the indictments are related to human trafficking networks. Since the indictments are sealed by a judge, it would be illegal for anyone to reveal their content. Yet, as Ruskin pointed out, with political cases it’s not uncommon for details to be leaked to the press. He said the lack of chatter in legacy news outlets may suggest that the higher-ups have no political interest in leaking their content. Ruskin said that among the causes mentioned for the surge of sealed indictments, the most plausible, he believes, is that it is related to human trafficking. Even his work investigating the mafia didn’t generate anywhere near as many sealed indictments as those currently pending; but with a human trafficking network, he said, there would be multiple groups operating in multiple districts—which fits the profile. This would also fall in line with recent actions of President Donald Trump, who on Dec. 21, 2017, signed an executive order declaring a national emergency over human rights abuses and corruption. Trump declared January 2018 as National Slavery and Human Trafficking Prevention Month.